Hello North Carolina. Hello BBQ! 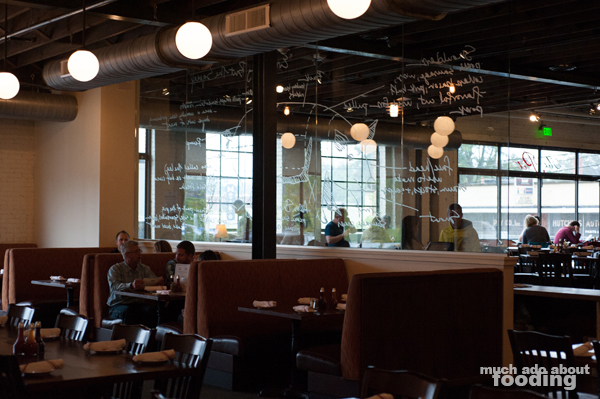 I have been liking the restaurants that have cropped up in Durham since I left the area after graduation, especially due to the more pronounced attention they have given to NC agriculture. There have also been expansions from surrounding cities' restaurants that seem to be much welcomed. One result of that was The Pit which has a location in Raleigh as well. We had heard about The Pit from several other people and when you throw the phrases whole-hog and pit-cooked around, we are there. 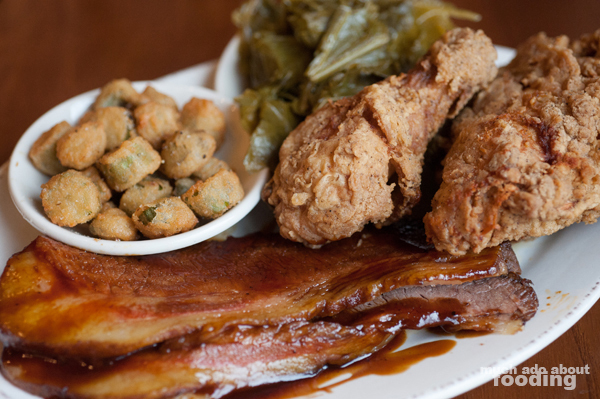 Add in the bonus of hogs raised free-range and locally with attention to animal welfare, and you've got yourself a fine place to find yourself sitting, chowing down on some southern BBQ (they do it Eastern North Carolina style here). The restaurant is conveniently located near Fullstream Brewery, a craft brewery that slings some great pints if you find yourself down in that neck of the woods. 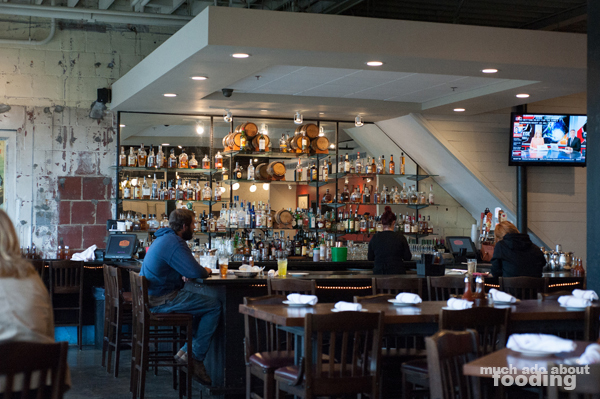 Touting whole-hog cookin' and featuring quite the numerous amount of seats for BBQ enthusiasts, The Pit opens out to a very welcoming interior complete with dark wooden chairs and wide spacing, lit perfectly with natural light streaming in from large windows surrounding the building. An impressive bar was tempting but we went on over to the booth seating to relax comfortably before diving into the menu. Of course, sitting down, we immediately got a basket of warm biscuits and hushpuppies accompanied by honey whip - that's hospitality! As for the menu, there was no deficit of delicious starters to tempt us. 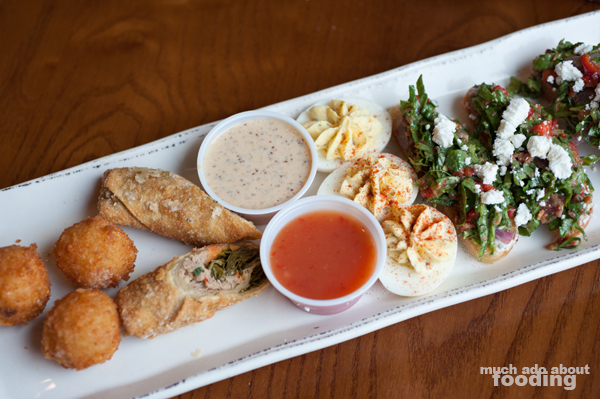 In order to satisfy as many of our curiosities as possible, we ended up just ordering The Sampler ($12.99 - BBQ soul rolls, jowl bacon bruschetta, southern-style deviled eggs & fried pimento cheese) to get a taste of everything. Full orders of the shareable appetizers would have been assuredly too much. We started on the Fried Pimento Cheese ($5.99 - served with a spicy pepper jelly) and were immensely glad to have. Oozing cheese with a little spice fried up in a ball? Perfection. 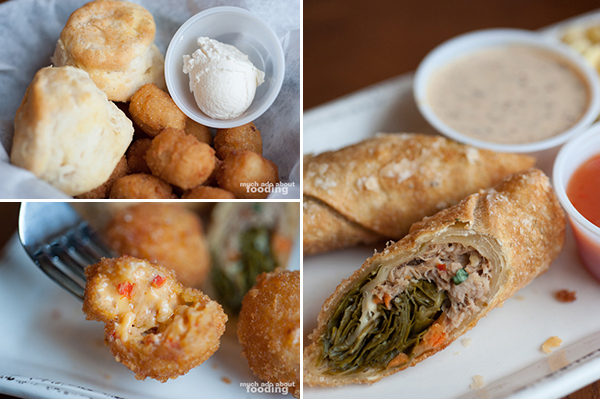 The BBQ Souls Rolls ($6.59 - chopped pork BBQ, cabbage collards and candied carrots served with Oak Island sauce and pepper jelly) were a riff on fried spring rolls and likely our least favored of the platter. However, it did pull across some signature flavors of southern cuisine, especially with the collards done well and the smokiness of pork BBQ. 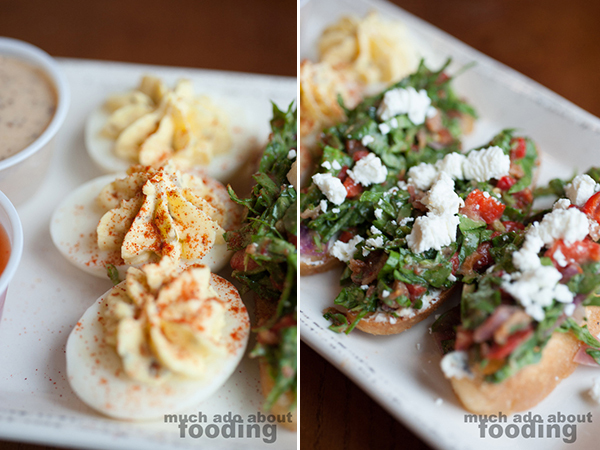 After having such heavy beginnings, we delved into the Southern-Style Deviled Eggs ($5.59 - pickle relish & smoked paprika) which were creamy, smooth bites with plenty of personality. The Jowl Bacon Bruschetta ($7.99 - crispy jowl bacon, spinach, caramelized red onion & goat cheese over hearty ciabatta) was a little messy to deal with but refreshing while being savory. I really liked how the goat cheese played with the caramelized red onion here. 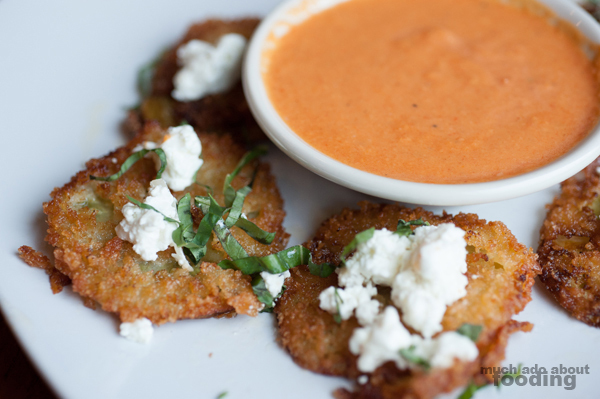 Then we followed up the sampler platter with Fried Green Tomatoes ($6.59 - served with goat cheese & red pepper vinaigrette) which had good batter around each slice but were not as crisp as hoped for. Perhaps they were sliced too thinly. Regardless, they were still tasty and paired with a delicious dipping sauce. Onto the famous stuff! Duc went for their “Outside Brown” Chopped ($8.99 - pit-cooked and seasoned with a spicy vinegar tang) which came with two sides; his choices were the Creamed Corn and Mac & Cheese, both rich and quite creamy. 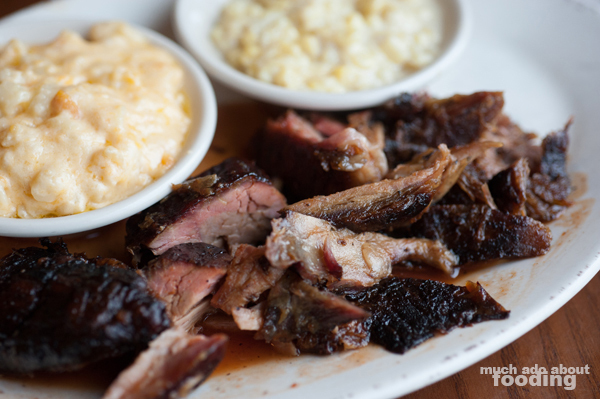 In true NC BBQ fashion, the pieces came slightly vinegary from the sauce and brilliantly smoky in taste. The more heavily browned edges to each chunk of meat gave a great texture to every bite along with a bit of meaty caramelization. It was extremely moist as well, making us jealous of the Durham residents who have the opportunity to experience such a great meal at any given time. I couldn't decide so went for their Double Combo ($11.99 - choose two: chopped, pulled, Lexington outside brown or shoulder, chopped turkey, brisket, or fried/barbecued chicken), going for their brisket and fried chicken. 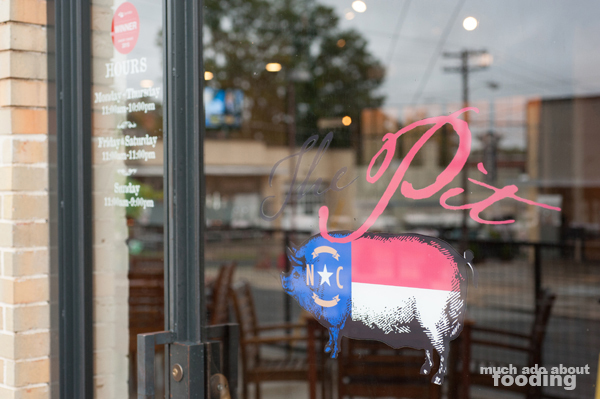 Separately, the items are available on the menu as such: Beef Brisket (slow cooked and tender) and The Pit’s Southern Fried Chicken (the best in town). My sides were their Cabbage Collards and Fried Okra, both done very well with proper attention to southern tradition. Right away, I knew the brisket would be good because of how tenderly it yielded to my fork's touch. Could I slice at it without a knife? Practically. 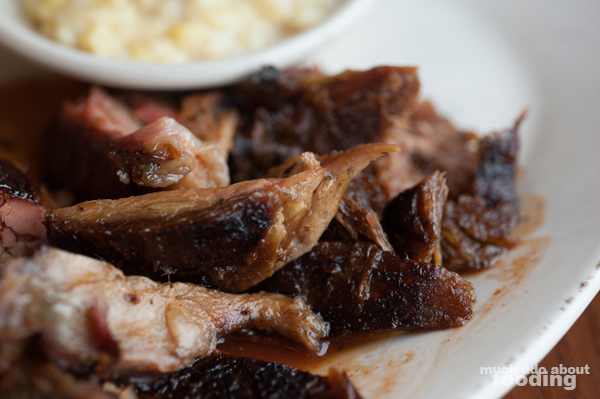 It had been roasted to a melt-in-your-mouth softness that serves as a prime example for great beef brisket. The chicken also deserved its boastful claim because the batter on that was phenomenally seasoned and crunchy; the first bite was surely audible through the dining room! I really enjoyed how juicy the chicken meat was underneath the perfect crust as well. It is rare to get fried chicken that is done well on both exterior and interior accounts. Our verdict? We must come back.